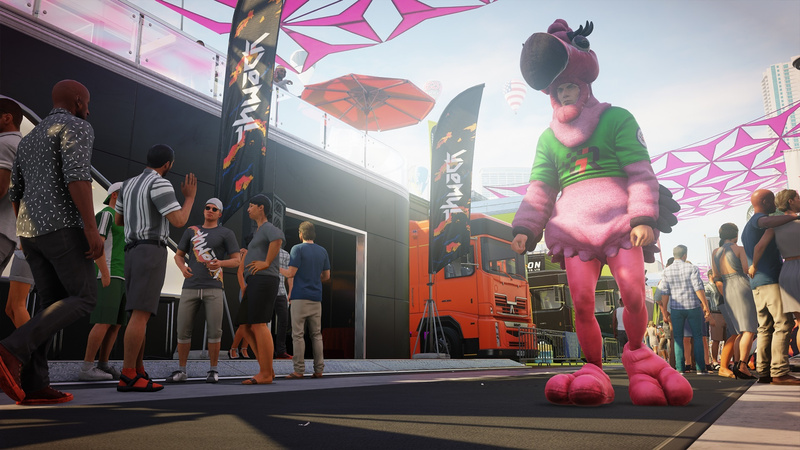 There’s surely a formula to the very best Hitman levels, and the good news is that Hitman 2’s new Miami stage follows it to a tee. While you get the feeling this vibrant environment could have been added as an episode to the first season, developer IO Interactive would no doubt argue that a lot has changed under the hood. From where we’re sitting, it’s more Hitman. But when the levels are this good, who cares? The backdrop, built around a racetrack, sees you trying to eliminate two unscrupulous motorsport moguls – one of whom is competing in the race. What’s the best way to assassinate the shady Sierra Knox, then? Tamper with her car’s engine? Snipe her at a pit stop? Cause an “accidental” high-speed crash? All possible, we suspect, but opted to dress as a flamingo. Stealing the costume of the racetrack mascot is simple enough, as it turns out you’re not the only individual hoping to attain an audience with Ms Knox: there are some blackmailers roadside, and they have evidence that will guarantee a big payday. Of course, you’re going to use it differently: to get face time with the tycoon – and push her down a lift shaft. The open-ended mission structure means that replayability will be through the roof, and while we didn’t actually get to test out any of our theories, our mind was whirring as we watched the patterns of our targets and learned more about the environment itself. 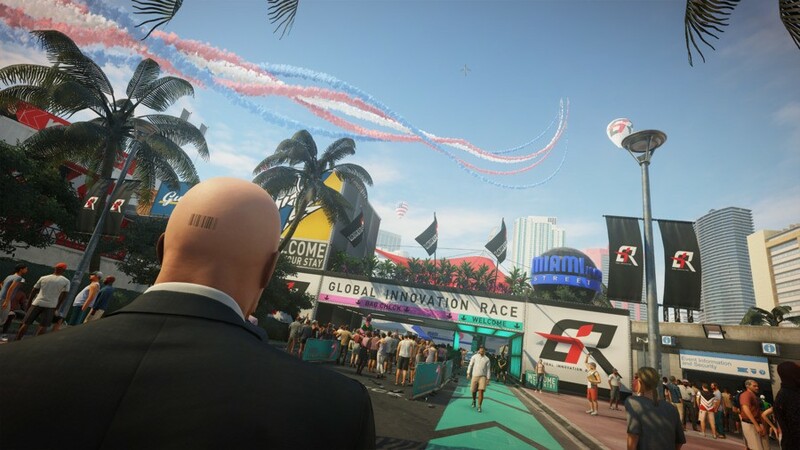 It’s big and busy sandbox, like all the best Hitman levels are, and the use of colours and confetti lends a festival atmosphere. Even better is that the voice acting appears to be improved. A real weak point in the first season, line delivery seems much more consistent, while the accents don’t appear out of place – although we’re still half expecting the title’s new Colombian jungle to be populated with mercenaries that sound like they’re enjoying afternoon tea with the queen. The series, historically, has been bad at this stuff. How are you hoping to put the Knox family to sleep? Are you ready for more Hitman, or does more of the same actually turn you off? Plot the perfect assassination in the comments section below. I only just started Hitman having not expected much when I was bought it last year. It is fantastic! Genuinely excellent game with a tonne of hours of replay value. They have been so clever with how they have made the missions different for each attempted play through. Anybody else worried that we still haven't seen anything beyond Miami and a brief tease of a jungle? Great write-up all the same, Sammy! Killing as a flamingo is making me way more excited for this game than it really ought to. @RogerRoger To be honest, I kinda am. I worry that Miami will be far and away the best level, and the others will be phoned in. But hopefully not. @RogerRoger @get2sammyb I’m glad they haven’t shown anymore levels, I’d rather see and experience them for the first time as I progress through the game. On many occasions developers lately have been revealing too much of their games before it’s even released that by the time we get to play it we know what to expect as we progress through the game and that spoils the whole experience imo. I have that much faith in IO that I’m going to get the Gold Edition even though I haven’t a clue what the two expansions are going to be like because as a big Hitman fan since Codename 47, IO have never let me down and for me, they have always delivered in every Hitman game released. @beemo @MaccaMUFC Oh, don't get me wrong, I'm super-excited for this game (a fellow Gold Edition pre-order here) and trust IO to deliver, but given the fact that they've had to shop around for publishers whilst developing this game thanks to being ditched by SquareEnix... well, I just expected a little more publicity to try and allay any concerns about the behind-the-scenes situation, especially since Miami was probably almost finished before they were ditched. The Miami level has been taken to so many shows now, to the point where there are multiple full walkthroughs on YouTube, that I kinda expected to see something more from the other levels by now. 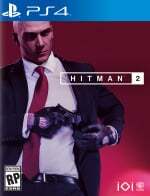 The previous game had seven unique locations and they've assured us that Hitman 2 will be "a full game" on release; I guess I'm just wondering how full that means. I don't expect full gameplay demonstrations or anything, and agree with concerns about the recent over-saturation of marketing some games have suffered from, but a two-minute sizzle reel featuring one or two places other than Miami might be nice. As @get2sammyb says, however, hopefully our concerns are just an unfortunate by-product of modern marketing tactics. My pre-order stays.